Back in the early days of this blog, I wrote a long paper about the role of transit and what a truly regional plan would look like. To avoid extensively quoting myself, I suggest that any newcomers to this site read that as a starting point as it contains not just a list of routes, but a philosophy of how one should look at transit. Since 2006, we have seen Transit City, MoveOntario2020 and The Big Move. The GTA appeared well on its way to real progress in transit although problems, notably the question of local service funding, remained. Now we have a new Mayor in Toronto, and plans that came from years of work and debate lie in pieces on the floor. Metrolinx and Queen’s Park seem content to “plan” by carving up funding that’s already committed and redrawing their map to suit the whims of a new regime at City Hall. The fundamental problem in this exercise is the phrase “funding that’s already committed”. When you draw a map with a half empty pen, you make compromises, and you run out of ink leaving huge areas bereft of service. 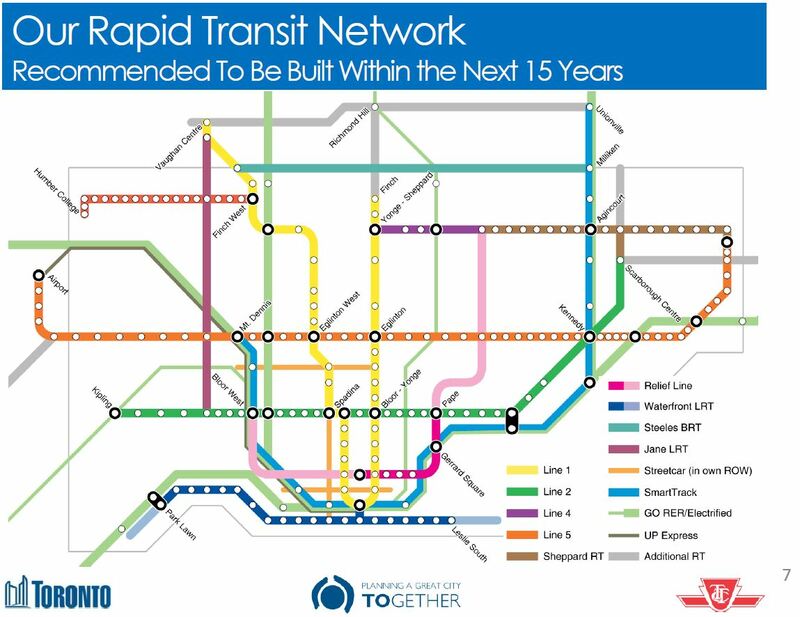 If redraw we must, then let us do so with a view to a transit network and to a view beyond the end of next year. What does Toronto and the GTA need? How much will that cost? How do we pay for it? If we start with the premise that we cannot afford anything, we should stop wasting our time on planners, engineers and the myth that transit can actually transform travel for the next generation. The discussion below is Toronto centric because this is a Toronto blog, and that’s where most of the GTA’s transit riders are. All the same, the philosophy of what transit should be affects everyone, especially in those areas where so much transit growth is needed just to catch up with the population. Some of the info here will be familiar to those who read my commentaries regularly, but I wanted to pull it all together as a starting point. My comments are not intended as the one, definitive “solution”, but to show the need for debate on a large scale, integrating considerations from many parts of various schemes. Part 1 of this article reviewed recent approvals and designs for the Eglinton LRT. In part 2, I will turn to the remaining Transit City routes. The main article follows the break below.